7 % OFF on IronDaddy.ws for GoldenMuscles visitors !!!!!!! Doesn’t matter whether you are beginner or professional bodybuilder, on Daddyroids.com there are assortment of products for all our customers. Now you can purchase your anabolic products, in front of your computer, and so, avoid the black market, its fake products and high prices. The 2011 FLEX PRO will feature the FLEX Bikini Model Search – California. FLEX Magazine is proud to announce the first FLEX Bikini Model Search to be held in California. 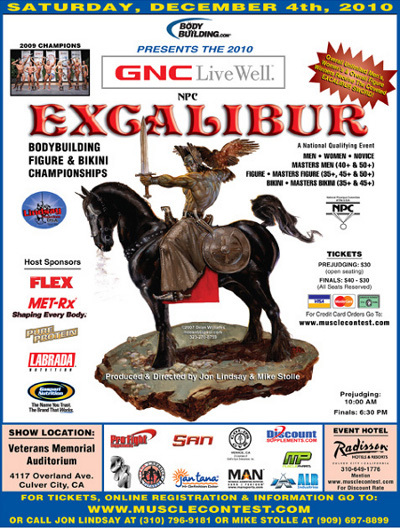 The contest will be held together with the IFBB FLEX Pro Bodybuilding Championships at the Santa Monica Civic Auditorium on February 19, 2011. The winner of the model search will receive $500 cash prize, $500 gift certificate from Chynna Dolls Bikinis, appear in the pages of FLEX Magazine and earn a spot in the 18-women finals at the FLEX Bikini Model Search in Las Vegas held during the Olympia Weekend on September 16 & 17, 2011. 2010 in coming to an end and the competitive season will be closed with 2010 NPC Excalibur Bodybuilding, Figure and Bikini Championships. The event will be hold in Culver City, South California on 4th of December. 200 participants are expected to take part in this contest. With his second at this year’s Phoenix Pro 202, Swedish resident Ahmad Ahmad established himself as one of the world’s premiere 202 competitors. Ahmad’s shoulders are a strong point, so we got him to tell us the key to his delt work and delineate a typical shoulder routine. Ahmad hits shoulders before triceps once every six days. Nicole Nagrani wins bikini, Kizzy Vaines wins fitness, and Kristal Richardson takes figure! For the second year, the Fit Girls Productions Team of IFBB Pro Shannon Dey and IFBB Pro Kristen Nagrani are attracting an all-female IFBB/NPC in Fort Lauterdale, FL. Fort Lauderdale Pro Fitness and Figure Cup will be held on November 20, 2010. The hotel that will host this event is located just off of the Intercoastal Waterways. Ladies with well defined bodies will share the stage. There are some new competitors this year, and it will be a lot to watch there. It is an event that you should not miss. 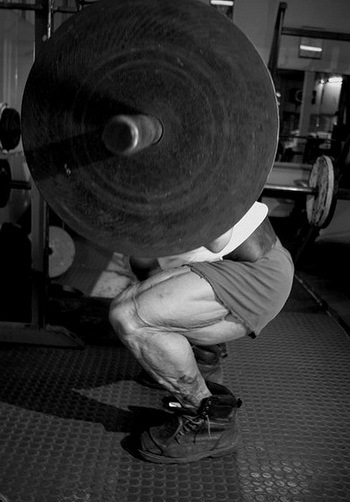 If you’ve been making less than stellar increases with your heavy weights lately, consider revamping your power training to include unilateral movements. “Unilateral training for your lower body is an excellent way to break through plateaus,” according to Tom Seabourne, PhD, author of The Pocket Idiot’s Guide to Great Buns and Thighs (Alpha, 2006). He recommends rebuilding your workout program around unilateral movements for 4-6 weeks to focus on strengthening your lower body one leg at a time. Use light dumbbells when you begin. “You can also stand near a wall or hold onto the post of a squat rack to help stabilize yourself if you can’t maintain your balance,” he instructs. 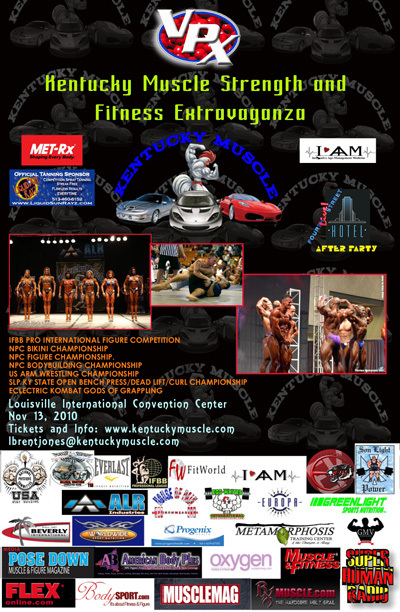 2010 IFBB/NPC Kentucky Muscle Extravaganza nov 13th! Read more2010 IFBB/NPC Kentucky Muscle Extravaganza nov 13th! Women’s Physique Division will be more muscular than Figure without the size and conditioning in Bodybuilding, a classic look. 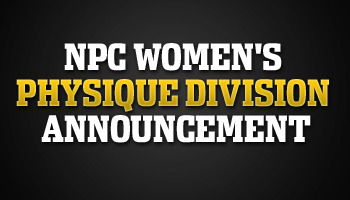 Women’s Physique will begin in 2011, but will only be held with NPC national competitions. Tentatively starting with NPC Jr. Nationals then Team Universe, USA & Nationals. No local, state or regional competitions will have them in 2011. Also with an IFBB Professional League division in 2012. Details & rules still being worked out. But the competitors will be barefoot, no heels. Women’s physique division (herein referred to as “WP”) has been created to give a platform for women who enjoy weight training, competing, contest preparation. Competitors should display a toned, athletic physique showcasing femininity, muscle tone, beauty/ flow of physique.